Back in May, I got an email from the same person who sent in photos of the Aquí Market in Califon, NJ asking if I would be interested in photos of the Foodtown in Denville. Of course! So all the photos in this post are courtesy of Gerry K.
This is a store I'd been to, but before I started taking pictures. 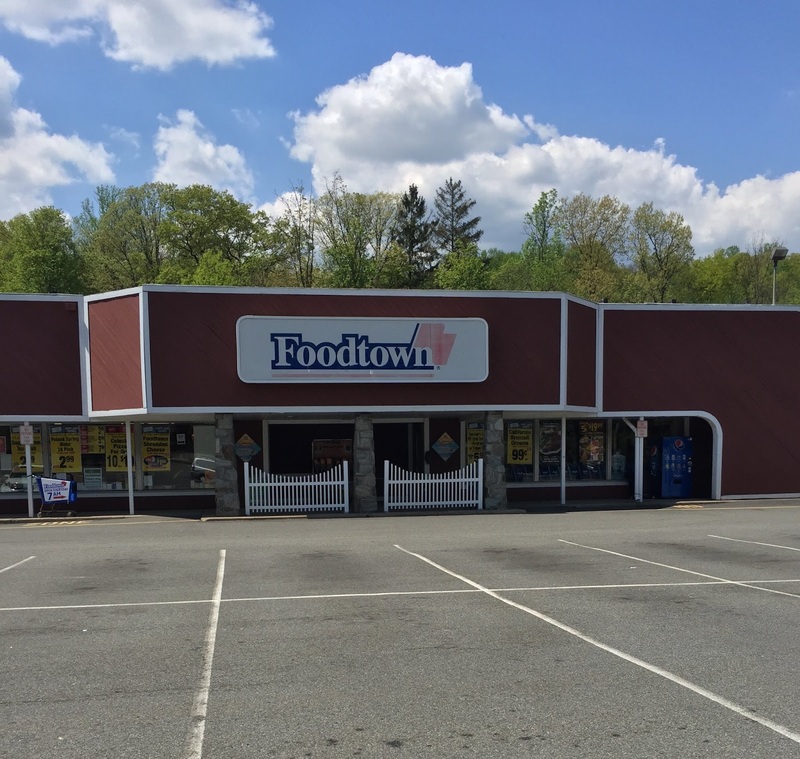 Foodtown, or Dickerson's Market, has been in Denville since 1893, operating first a small general store before building the existing supermarket in the 1950s. Although the store has been renovated slightly over the years, it's still an amazing step back in time -- but not, by any means, outdated. That makes perfect sense, right? Either way, this is still a great store and worth a stop if you're in the area. The most recent change has been painting the facade of the strip. It used to be blue/turquoise and was not, um, particularly attractive. The new paint job makes the building look pretty good, and blend in with the suburban-bordering-on-rural area. I don't believe the outside has been significantly altered since the 1950s either. The famous Open Everyday cart! This is often put out by the road to catch the eyes of passing drivers. 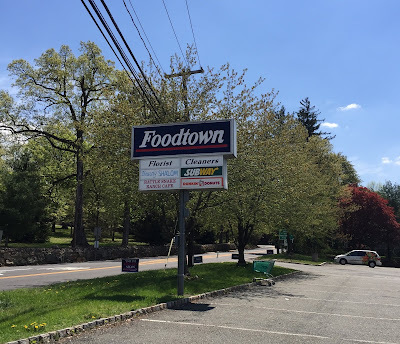 This sign isn't quite the current Foodtown logo and isn't quite the previous Foodtown logo either; it's a hybrid logo that we've seen before. Produce lines the first aisle with a small deli in the back corner, which is the only service department the store has. This store regularly stocks plenty of local and organic produce, especially in season, plus the floor is very nice. The cases might have been replaced after the store opened, since two-tier produce cases were not very common in the 1950s. Check out that deli sign! Now that's original. Although it's not the intended look, the backs of the hanging promotional signs actually look great in front of the angled lit panels. Plus, it's impressive that all the lights actually work. The effect is really diminished when they don't (ShopRite of Columbia Park). Hmm. But maybe someone could change that lightbulb above the deli. ...but it's far less extensive than, for instance, Key Food or Krasdale. So they supplement with Best Yet. Meat cases line the back wall. Unlike many of the Key Food stores, Foodtowns tend to have larger selections of HABA and nonfoods. The last aisle contains some frozen foods and dairy. This bothers me. The Greenway storebrand organic milk is always cheaper than the name brand but comes in only 1%, 2%, or whole. I only buy skim milk. Why?!? You can't find too many stores like this anymore. This is a real small-town grocery store that's still doing a great job even with a huge Acme in town (also Olive Tree, which lasted what -- two years?). Stop by if you're ever in the area, and say hi to Jeff Dickerson, store owner/manager! I have to ask... is it just me, or do those carts REALLY look like old Ames carts? You may be right, but the facade of this store also used to be painted that light blue/turquoise color. I think there may have been an Ames in Rockaway, which is maybe ten minutes away. There was-- the building started out as a Two Guys. When they went out, it was split into a Jamesway and a ShopRite. When Jamesway went out, Ames came in-- and when they collapsed, TJ Maxx and Dollar Tree subdivided the Ames space. I mostly associate this Foodtown logo with the Mayfair-owned stores. Their carts had "Mayfair" written in a similar style, and some store signage read "Mayfair" with a smaller "Foodtown" below, both in the same font. I used to assume this logo was only for the Mayfair stores, but it does seem that other stores had it - besides this one, non-Mayfair stores. stores in Springfield and Manville used to have it. Oh, OK. That makes sense. I'm not too familiar with the Mayfair stores, so thanks for the info!